Travel light, and smart, with Rolo. 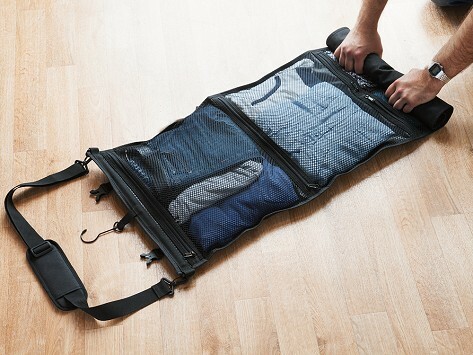 This lightweight travel bag has four separate mesh sections—two large and two small—that can hold up to four days’ worth of clothing and toiletries. No need to pack & unpack a suitcase on short trips or when hiking, camping, or backpacking. Just roll and unroll Rolo. 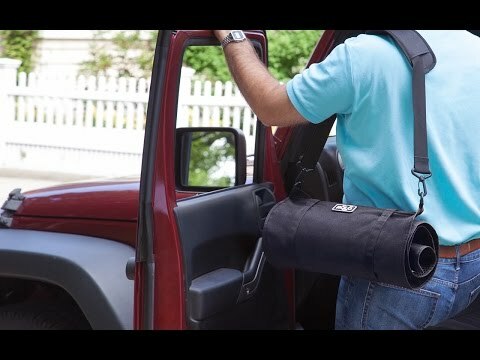 Dimensions: Rolled: 4" x 17" x 4.5" Unrolled: 45" x 17" x 1.5"; Two Upper Pockets: 13" x 16.5"; Two Lower Pockets: 14.5" x 8"
The best solution for family travel. I purchased this to use for a trip to Asia..multiple countries & just 1 carry on suitcase...it worked beautifully..What I love: that it’organizesanizes & fits everything in concise compartments...roll it up tight-than clip straps & tighten further..really is a space saver..when u get to destination pull out of suitcase & hang in closet...Everything is easy to see & right at your fingertips.. Such a Time saver! Love it! That epiphany became Rolo. Carry less, travel smarter, and enjoy yourself more when you’re away.